C-Net’s access control solutions can be used universally anywhere where security is prime concern. The security within an institution where an employee entering into can be checked or segregated between authorized and unauthorized persons by implementing this solution. It allows only authorized persons to access a restricted area. Each faculty/employee will be issued a Smart ID card displaying institute information to identify the card as official. Each card stores the protected information about the faculty/management person and his privileges. When the faculty is initially enrolled and accepts the card, these privileges are accurately and securely populated throughout the system. 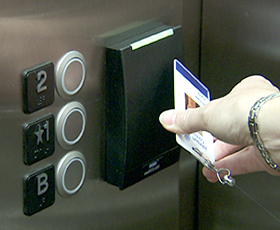 As soon as the card is placed in or near an electronic reader, access is securely granted or denied at all appropriate places. When an employee leaves an organization, all physical access privileges are removed at once. Similar mechanism can be implemented for biometric tools like face recognition, finger printing, retina scanning, voice recognition etc. We provide a customized surveillance solution that gives you the best coverage. Our team works with some of the most prestigious system integrators, giving you an end to end solution that is complete in every way. Our solutions can be deployed for a number of reasons like monitoring public areas, recording events, directed surveillance etc.